Current US law extends copyright for 70 years after the date of the author’s death, and corporate “works-for-hire” are copyrighted for 95 years after publication. But prior to the 1976 Copyright Act (which became effective in 1978), the maximum copyright term was 56 years—an initial term of 28 years, renewable for another 28 years. Under those laws, works published in 1959 would enter the public domain on January 1, 2016, where they would be “free as the air to common use.” Under current copyright law, we’ll have to wait until 2055.1 And no published works will enter our public domain until 2019. The laws in other countries are different—thousands of works are entering the public domain in Canada and the EU on January 1. The Longest Term. . .
What books and plays would be entering the public domain if we had the pre-1978 copyright laws? You might recognize some of the titles below. The books above are but a fraction, a tiny fraction, of what would be entering the public domain on January 1. Imagine them being freely available to students and educators around the world. Readers – from the conspiracy theorist to the grammar enthusiast, the student of racial injustice to the sociologist – would have something to celebrate. And then there are the sci-fi offerings, fromCanticle to Troopers. "Long ago, during the last age of reason, certain proud thinkers had claimed that valid knowledge was indestructible—that ideas were deathless and truth immortal." At least if you can get to it. On the bounce, readers! You would be free to use these books in your own stories, adapt them for local theater, or make them into a film. You could translate them into other languages, or create accessible Braille or audio versions.2 (If you think publishers wouldn’t object to this, you would be wrong.) You could read them online or buy cheaper print editions, because others were free to republish them. Empirical studies have shown that public domain books are less expensive, available in more editions and formats, and more likely to be in print—see here, here, and here. Imagine a digital Library of Alexandria containing all of the world’s books from 1959 and earlier, where, thanks to technology, you can search, link, annotate, copy and paste. (Google Books has brought us closer to this reality, but for copyrighted books where there is no separate agreement with the copyright holder, it only shows three short snippets, not the whole book.) Instead of seeing these literary works enter the public domain in 2016, we will have to wait until2055. 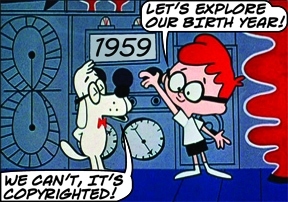 Rocky & His Friends brought us the WABAC time machine, used by Mr. Peabody—the genius dog—to explore history with his adopted son, Sherman. (The name inspired the Internet Archive’s Wayback Machine.) We have the technology to populate our own WABAC machine with the books, movies, and music from 1959. But we can’t do this legally, because of the copyright term. 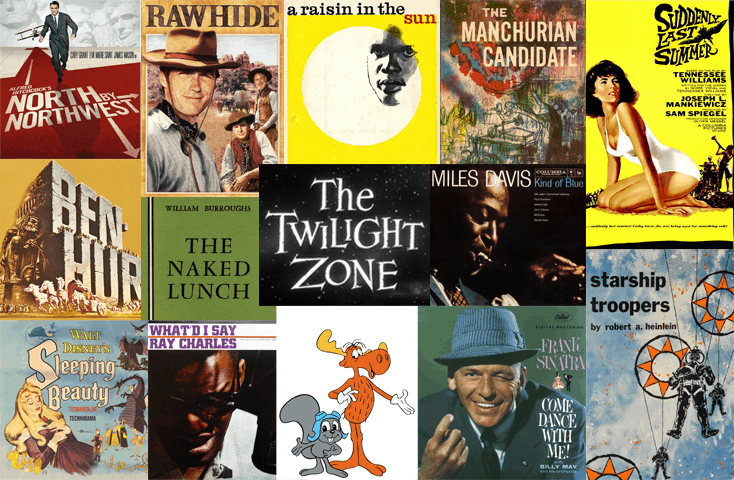 Consider the films and television shows from 1959 that would have become available this year. Fans could share clips with friends or incorporate them into homages. Local theaters could show the full features. Libraries and archivists would be free to digitize and preserve them. Here are a few of the movies that we won’t see in the public domain for another 39 years. Many of these movies were built on public domain works. Ben-Hur was based on Lew Wallace’s novel Ben-Hur: A Tale of the Christ(1880). Sleeping Beauty drew on fairy tales including Charles Perrault’s La Belle au bois dormant (1697) (itself based on earlier fairy tales) and the Brothers Grimm’s later version of Perrault’s story (1812). Journey to Center of the Earth adapted Jules Verne’s 1864 novel of the same name. One work inspires another. That is how the public domain feeds creativity. 1959 was another noteworthy year for science. C. P. Snow presented The Two Cultures and the Scientific Revolution, an influential lecture about the gulf between the sciences and the humanities. The programming language COBOL was developed. Martin Gardner published the Three Prisoners Problem, a probability theory paradox, in his “Mathematical Games” column in Scientific American. Giuseppe Cocconi and Philip Morrison published Searching for Interstellar Communications, a foundational work for the search for extraterrestrial intelligence, in the journal Nature. If you follow the link from Nature above (and you do not have a subscription or institutional access), you will see that this 1959 article is behind a paywall. You can purchase it for $32. A distressing number of scientific articles from 1959 require payment or a subscription or account, including those in major journals such as Science and JAMA. And the institutional access that many top scientists enjoy is not guaranteed—even institutions such as Harvard have considered canceling their subscriptions because theycould no longer afford the escalating prices of major journal subscriptions. It’s remarkable to find scientific research from 1959 hidden behind publisher paywalls. Thankfully, some publishers have made older articles available in full online, so that you can read them, even though it may still be illegal to copy and distribute them. In addition, some older articles have been made available on third party websites, but this is not a stable solution for providing reliable access to science. Third party postings can be difficult to find or taken down, links can get broken, and would-be posters may be deterred by the risk of a lawsuit. Under the pre-1978 copyright term, all of this history would be free to scholars, students, and enthusiasts. Not all scientific publishers work under this kind of copyright scheme. “Open Access” scientific publications, like those of the Public Library of Science, are under Creative Commons licenses, meaning that they can be copied freely from the day they are published. Most of the works highlighted here are famous—that is why we included them. And if that fame meant that the work was still being exploited commercially 28 years after its publication, the rights holders would probably renew the copyright. But we know from empirical studies that 85% of authors did not renew their copyrights (for books, the number is even higher—93% did not renew), since most works exhaust their commercial value very quickly. Under the law that existed until 1978 . . . Up to 85% of all copyrighted works from 1987 might have been entering the public domain on January 1, 2016. That means that all of these examples from 1959 are only the tip of the iceberg. If the pre-1978 laws were still in effect, we could have seen 85% of the works published in 1987 enter the public domain on January 1, 2016. Imagine what that would mean to our archives, our libraries, our schools and our culture. Such works could be digitized, preserved, and made available for education, for research, for future creators. Instead, they will remain under copyright for decades to come, perhaps even into the next century. Perhaps the most troubling aspect of the current copyright term is that in most cases, the cultural harm is not offset by any benefit to an author or rights holder. Unlike the famous works highlighted here, the vast majority of works from 1959 do not retain commercial value,5 but they are presumably off limits to users who do not want to risk a copyright lawsuit. This means that no oneis benefiting from continued copyright, while the works remain both commercially unavailable and culturally off limits. The public loses the possibility of meaningful access for no good reason. You can read more about the current costs associated with orphan works—works that are still presumably under copyright, but with no identifiable or locatable copyright holder—here and here. Importantly, the US Copyright Office has been engaged in efforts to find solutions to the orphan works problem. Despite the fact that these lengthy copyright terms have been a cultural disaster, and have imposed great costs on society without offsetting benefits to authors, the United States has led the charge to impose them on other countries whose copyright terms are "only" life plus fifty. For example, the Trans-Pacific Partnership Agreement would add 20 years to the copyright terms of half of its signing countries, and mandate the longer term as a minimum. Ponder that for a moment. We have a copyright term that even the top government copyright officials admit is a mistake. And we are locking ourselves into it permanently. And imposing it on others. Perhaps we need a.... Canticle… for the public domain. 1 The copyright term for works published between 1950 and 1963 was extended to 95 years from the date of publication, so long as the works were published with a copyright notice and the term renewed (which is generally the case with famous works such as those we are highlighting). Many works published in 1959 are already in the public domain because the copyright holder did not comply with notice, renewal, or other copyright formalities. However, tracking down this information can be difficult (you can read just one of many illustrative examples collected by the Copyright Officehere). Therefore, users often have to presume these works are copyrighted or risk a lawsuit (only works published before 1923 are conclusively in the public domain). You can read more about copyright terms from this excellent chart and from the US Copyright Office’s guide. It is also difficult to determine whether foreign works are in the public domain in the U.S. Generally speaking, as a result of international agreements, foreign works published after 1923 are still under copyright in the US as long as one of the following is true: they were published in compliance with US formalities, they were still copyrighted in their home countries as of 1996, or they were then published in the US within 30 days of publication abroad. You can learn more about copyright terms for foreign works from the Copyright Office guide here. 2 US copyright law has an exception that allows books to be reproduced in accessible formats, but this exception only applies to “authorized entities”—nonprofits or governmental agencies with a primary mission related to providing such services. 3 The law allows libraries and archives (not preservationists generally) to digitize works during the last 20 years of their copyright term, but only in limited circumstances: the library or archive first has to determine through a “reasonable investigation” that the work is not being commercially exploited and that they cannot obtain another copy of it at a reasonable price. 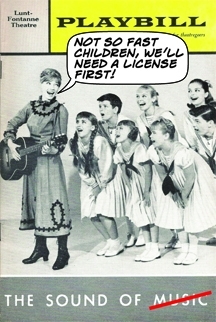 4 Under federal law at the time, these “musical compositions”—the music and lyrics—were subject to copyright, but the particular “sound recordings” embodying the musical compositions were not; federal copyright did not cover sound recordings until 1972. (Pre-1972 sound recordings are protected under some states' laws.) So, for example, the musical composition “Great Balls of Fire” written by Otis Blackwell and Jack Hammer would be federally copyrighted, but not Jerry Lee Lewis’s particular sound recording of that composition. 5 A Congressional Research Service study indicated that only 2% of works between 55 and 75 years old continue to retain commercial value. 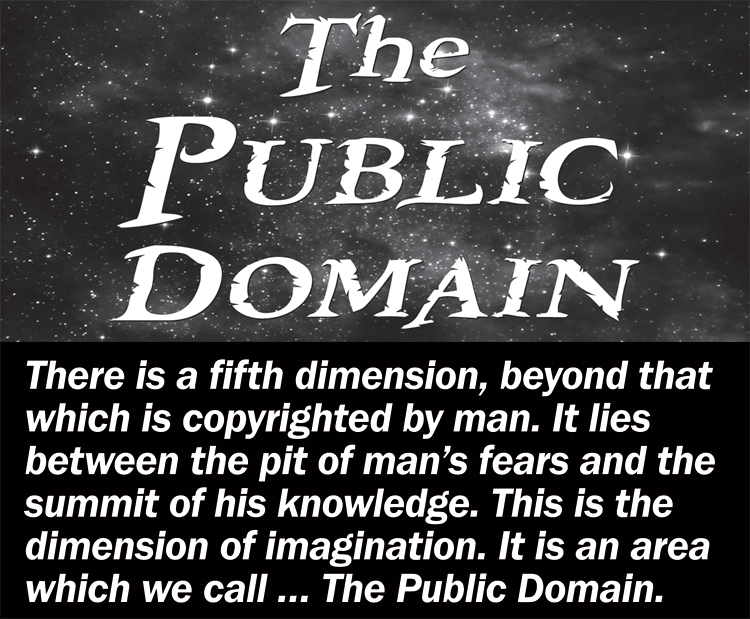 As explained above, many works from 1959 are technically in the public domain, but there is often no way to conclusively determine public domain status, so users have to presume that they’re still under copyright. Not the ones that the Internet Archive can get its hands on, no. And the same goes for books.